Interesting how a woman living in a society where females were expected to marry and have children and were only almost allowed to work until that happened, can be given a job where she proves to be good at it and such is the case for Kaden Stone. Kaden has become an aide to a detective Valeriel City and has been brought along to help discover who murdered the queen. She does more than that, which is a major surprise to all the men and how it was done is even more surprising. 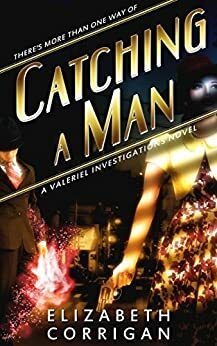 Catching a Man is the first in what I hope is a long series of Valeriel Investigations books. While I'm not normally into the 50s style era, the book focuses on several characters who act as outliers to what society dictates a normal man or woman (or royal family member!). What I love about Catching a Man is that while it stands alone well, there are so many seeds planted to build this series into much more than Kadin's small world. I can't wait to see what the next books bring! This was such an awesome read! I'm a big mystery lover and I just couldn't put it down. The characters are well-drawn and dynamic. Kadin Stone is a feisty, clever girl struggling to find her place in a male-dominated society. I look forward to the next book. 1.0 out of 5 starsHow not to catch a man...or solve a mystery! Elizabeth Corrigan brings to her readers a new mystery series based in an alternate reality that falls a bit flat and requires little of the readers imagination or logic to solve the mystery. I’m just gonna be very honest right here: this book was not very good. I felt like I was reading the diary entries of a high-schooler that had been printed in book form. Ms Corrigan offers readers an alternate world in which women are only allowed importance if they are married. Single women must be virgins ( not a bad idea in itself) to work in this kingdom called Valerial, but it is assumed that these women are only working until they can find someone to marry – preferably as soon as possible. Heaven forbid if they actually try to do their job! Enter Kadin Stone, newly graduated detective aid who is determined to do her job, and do it well, before she resigns herself to marriage. Problem is, Kadin is smarter than the detectives would like and this makes things twice as hard for her to find a place to belong. And because she is kind, she will find herself the confidant of more than one person involved in the case as well as the first to discover how the murder was committed and by whom. There was a lot of potential here for a good story, unfortunately Ms. Corrigan chose to make her story obvious and juvenile. As soon as the suspect who turned out to be the murderer was introduced to the main character I knew it was him. And then the rest of the story was Kadin bumbling around trying to find clues to an oversimplified case. And the whole inclusion of “sideways” men ( used as a euphemism for gay men) throughout the story was unnecessary and just silly. It was like the story wasn’t sure if it wanted to offer a mystery story or promote the gay lifestyle. I personally would have found it much better if Ms. Corrigan had spent more time “beefing up” her characters and the suspense of the book rather than using the majority of the pages to discuss the social habits and conversations of Kadin and her friends. As I already know, few authors who self-publish are really going to make it big in the world of writing. If a publishing company doesn’t like the story then I probably won’t either because it has no depth. I did give this story one star, however, because I liked the idea that this woman was not going to let others tell her how to live and work. And she had enough brains to try to find someone to marry who would treat her well rather than just give her a home and provisions. So, perhaps Ms. Corrigan can try again and create characters that have depth and personality that readers will connect with better. I will not recommend this book to others and will offer my review as a warning to avoid only. I will give Ms. Corrigan another chance in the future perhaps, if her next book comes from a real publisher and with a real, engaging plot. I received this E-book free of charge from Elizabeth Corrigan/Xpresso Book Tours via NetGally in exchange for a fair and honest review. I will receive no fiscal compensation from either of these companies for this review. My first Elizabeth Corrigan book and it won’t be the last. I do hope another in this series comes out. I also hope that Kadin ends up with Duke Baurus because who she is eyeing doesn’t deserve someone like her. He wants meek and not bold, smart and amazing. The story takes place in a alternate type of 1950′s era. We have magic and royalty. Here things are upside down and sideways up. Woman are expected to work only if necessary and so they can find a man to marry. People pay for the investigation insurance and through the roof if they want to have something investigated but medicine is free. The sideways community in this era is accepted whereas in our real 1950′s it was not. Kadin is a smart girl. She wants to do her job but also knows that society dictates she be married. She only wants to be married because she wants to lessen the burden on her brother and get out of his house and away from her sister in law. She has a nose for being a detective though and she likes it. She isn’t what she seems and we see a bit of a mystery about her as well. One I hope gets fleshed out in future books. There is good world building and fleshing of the murder mystery that has taken place. We see intrigue and secrets galore. I love the aura around the kind and how Kadin is smart as a whip when it comes to him and observation of things. She turns everything on its head and definitely changes the minds of people about her at the end. It was fun to see her two selves warring. She had the side that was more women’s rights wanting to work and not needing a man. And the side that her grandmother ingrained in her about needing to have a man in her life. Her passion though does rule when it came to solving who killed the queen. Kadin’s friends are a hoot. Ollivan has a double life- hr by day and party planner for the sideways community by night. He was the life of the party for sure. He is also a big gossip and it is him and her other friend that helps her know the players involved in the murder through their penchant for gossip. As she unravels one mystery another pops up and it adds a twist to the story itself. It also gives us a clue about someone and Kadin herself. And Baurus and her have an attraction you can’t deny. Or hope won’t be denied. The story is fun, unexpected and has twists and turns not expected. We get intrigue, fun banter, unexpected moments and outcomes, and a feisty smart heroine in Kadin who turns peoples opinions of her upside down and begins to come into her own and who she is more. She gains confidence and starts to find her place and her way. A fascinating, entertaining page turner with plot twists and turns with secrets, more mysteries coming about and a female lead in Kadin you cannot help but love.